As Americans we have a lot of freedom. One of those freedoms being to peacefully protest. Kneeling during the national anthem is a subject that had been floating around for a while and caused a lot of controversy. “It’s disrespectful!”, “What is the point?” are just two of many comments being made on the topic. Many feel it’s disrespectful to those who served our country but they’re missing the point. Kneeling in no way is for that cause. 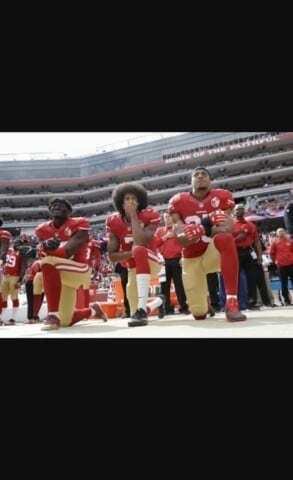 The sole purpose of kneeling is to bring awareness and to stand up and make a change for minorities who have put up with crap their whole lives. Now these people are speaking up. It’s clear why some would feel as though the protest is pointless, as a lot of people who don’t take the time to understand why thing are happening do, but it’s not about those people. And sadly, most of those that have a problem with the protest, are the reason we’re protesting. Don’t be afraid to stand up for what’s right. Whether it be by sitting, standing, marching, boycotting. Now is the time to make a difference. Kneel Down to take a Stand by Raigan is licensed under a Creative Commons Attribution-ShareAlike 4.0 International License.